A parliamentary report of 1777 recorded parish workhouses in operation at Wokingham Town (for up to 50 inmates), Shinfield (42), Wargrave (50), and Woodley and Sanford (50). County of Berkshire: Arbourfield [Arborfield], Barkham, Broadhinton Liberty, Earleigh (Earley) Liberty, Finchampstead, Newland Liberty, Ruscomb, Sandford and Woodley, Shinfield (2), Sonning, Swallowfield [2 parts] (2), Wargrave (2), Whistley Liberty, Winnersh Liberty, Wokingham (3). Later Additions (all from 1894): Hurst St Nicholas, Remenham, Twyford. The population falling within the Union at the 1831 census had been 11,888 — ranging from Ruscomb (population 160) to Wokingham itself (3,139). The average annual poor-rate expenditure for the period 1832-35 had been £8,153. 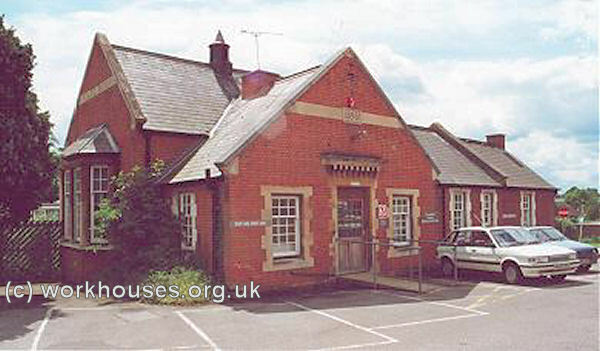 The new Wokingham Union initially made use of the former Wargrave parish workhouse, for the upgrading of which the Poor law Commissioners authorized an expenditure of £1,390. However, a report by Edwin Chadwick in 1846 found that conditions were too cramped to allow proper segregation of the different classes of inmate, rooms were damp and badly ventilated, and there was a lack of infirmary and fever wards. Despite its apparent major shortcomings, the building was subsequently converted for use as the Reading and Wokingham District School. A completely new workhouse for 250 inmates was built in 1848-50 at a site on the northern side of Barkham Road on land purchased from Mr George Howell. 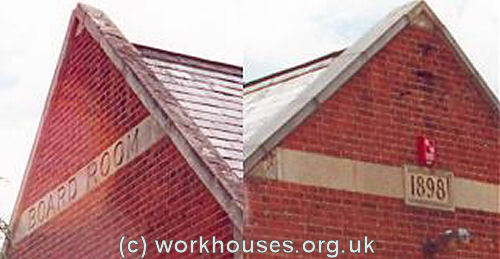 A competition was held to design the new workhouse. Fourteen entries were received and the £50 prize was won by Mr Richard Billing of Reading. The building contract for £6,200 went to Mr Trugo from London and work commenced in January 1849. The layout consisted of a three-storey T-shaped main block, with a separate infirmary block and fever ward to the rear which also contained the vagrants' wards and the receiving wards for new admissions to the workhouse. Women were housed in the eastern half of the site which also included the institution's laundry. Men were placed in the western portion, separated fronm the women's side by the dining hall. The workhouse layout is shown on the sketch plan below. 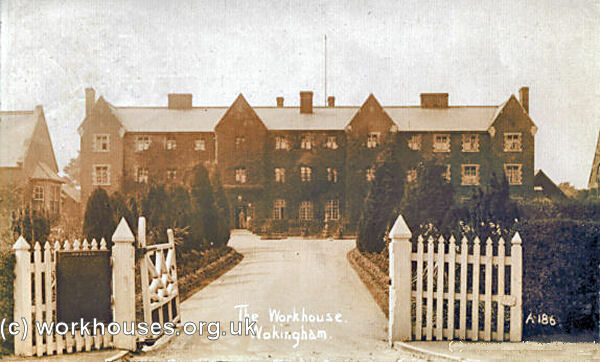 Wokingham workhouse from the south-east, c.1905. 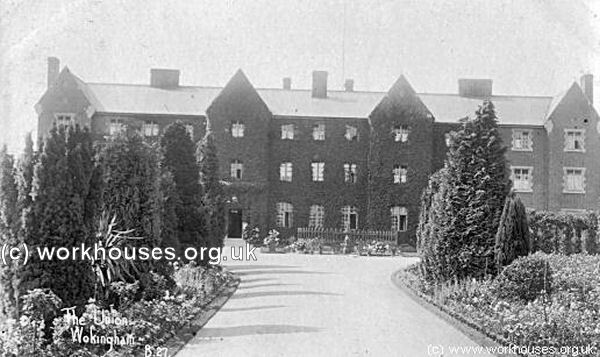 Wokingham main block from the south-east, c.1905. Wokingham main block from the east, 2000. 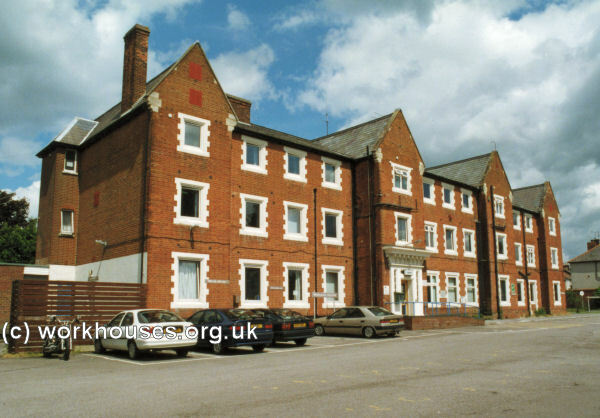 Wokingham board-room block from the north, 2000. Wokingham board-room block details, 2000. The former workhouse buildings now serve as Wokingham Hospital. In the early 1900s, the Union established a cottage home for housing pauper children on Oxford Road, Wokingham. Berkshire Record Office, Berkshire Record Office, 9 Coley Avenue, Reading, Berks RG1 6AF. Holdings include: Guardians' minute books (1835-1930); Relief order lists (1896-1930); Ladies Visiting Committee minutes (1880-1930); etc.